Several of the Oneida Nation’s enterprises, including Turning Stone, the new Point Place Casino, Yellow Brick Road Casino and Maple Leaf Market stores, announce “Go Orange” festivities in honor of Syracuse’s Sweet 16 game on Friday, March 23. The “Go Orange” celebration includes a unique “Two-Three Zone” special, Game Zones, Sweet 16 social media contests, and more. Well before tip-off against the Duke Blue Devils on Friday night, several of the Oneida Nation’s properties will “Go Orange” and show their Orange pride in support of Syracuse’s trip to the Sweet 16. Turning Stone, the new Point Place Casino and Yellow Brick Road Casino will all be bursting with orange, including an appropriately-themed special called the “Two-Three Zone,” in honor of Syracuse’s legendary zone defense. The “Two-Three Zone” at Turning Stone and Point Place Casino will be $2 off draft beers and $3 bottled beers and the “Two-Three Zone” at Yellow Brick Road Casino will feature $2 select domestic bottled beers and $3 well drinks. Additionally, the properties will “Go Orange” with banners, balloons and other orange décor, Game Zones with large screen TVs will be set up for guests to watch the game and cheer on the Orange, employees will be sporting their favorite Syracuse Orange attire and the iconic TS sign at the top of The Tower at Turning Stone will be shinning orange too. On Friday night, Turning Stone will set up a #TSOrangeNation Selfie Spot at the resort with a variety of orange props for guests to take and post their selfies using the hashtag #TSOrangeNation for a chance to win prizes including Free Play, dining credits and more (TS Rewards Card is required to claim prizes, which is free to sign up). The Oneida Nation and its enterprises are always proud to show their support of the Syracuse Men’s Basketball Team. 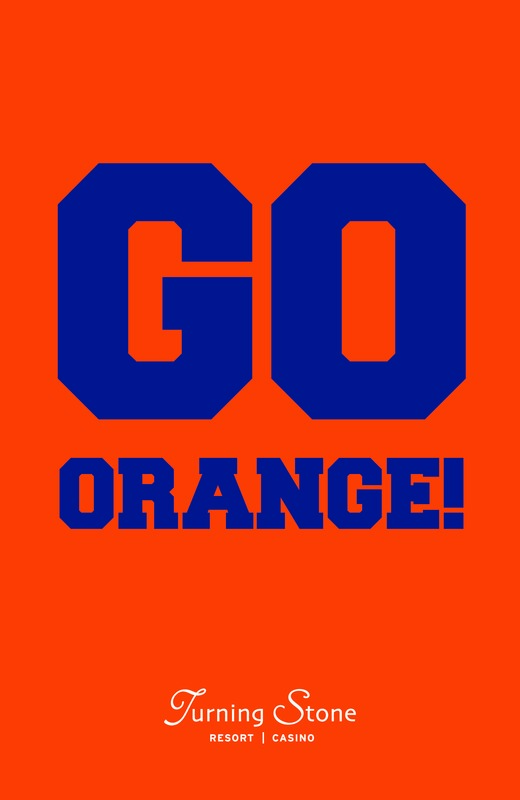 Go Orange!